Abraham Lincoln - 16th President of the United States serving 2 terms, from 1861 to 1865. Abraham Lincoln is from Kentucky. From Teaching with Primary Sources (TPS) funded by the Library of Congress. This website tabulates the illnesses of American Presidents and other notable people. Both laypersons and physicians will find it interesting. From the Miller Center at the University of Virginia. This site offers videos, pictures and interactive resources for studying the presidents. 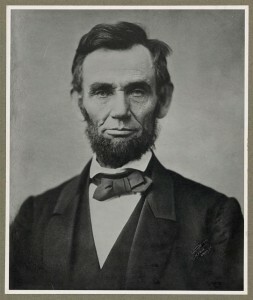 From PBS.org A variety of primary sources and interactive content including lesson plans to study the life of Abraham Lincoln. Abraham Lincoln spent fourteen years of his life (1816-1830) in southern Indiana. Read the words of Abraham Lincoln and other pioneers about the lives that they led on the frontier. The website offers historical information about the park for those who cannot visit in person. The Abraham Lincoln Library and Museum displays a diverse collection of Lincoln and Civil War relics. Featured pieces include; the cane Lincoln carried at Ford's Theatre, two life masks, and a tea set from his time in Springfield. There are more than 30,000 books, manuscripts, pamphlets, photographs, paintings and sculptures tell the story of President Lincoln and the Civil War. Four American presidents have been assassinated. Lincoln was the first. The Assassination of President Lincoln, Ford's Theatre, Washington, D.C. Content Warning: Graphic picture. From American Civil War.com and the Library of Congress. A scanned edition of the April 29, 1865 edition of Harper's Weekly. Abraham Lincoln served as President of the United States from 1861-1865. Assassination of President Abraham Lincoln including a timeline and photo gallery. This web site provides an overview of the life of Abraham Lincoln. Created by a retired American history teacher. The Mary Todd Lincoln House was the family home of the future wife of the 16th President. The 14 room house contains period furniture, family portraits and furnishings from the Todds as well as the Lincolns. The museum's main exhibits include a dozen dioramas of the life of the 16th president of the United States. Discover the connection between C.H. Moore and Abe Lincoln. A listing of places in Illinois where Lincoln traveled, lived or stayed. Created by the Lincoln Institute, an American History Project of The Lehrman Institute. Discover the original home of Lincoln's mother, as well as replicas of the 1782 cabin and blacksmith shop where his father was reared and learned his trade. The park offers a gift shop, golfing, picnicking and a museum. The park was opened in 1932 as a memorial to Lincoln's mother, Nancy Hanks. The park offers a Boat Launch Ramp, boating, camping, canoe, paddle boat and row boating rentals, fishing, a general store, hiking trails, Interpretive and nature Center, picnicking, and swimming. There are a variety of visitor activities available at Lincoln Home National Historic Site. Free Ranger led tours of the Lincoln Home are the central feature of the site. The Visitor Center offers orientation and interpretive films. The website offers historical information about the park for those who cannot visit in person. One of the most visited sites in the nation's capital. Celebrate the legacy of Abraham Lincoln and explore the American experience through theatre and education. Details the progress of Mr. Lincoln's opposition to slavery from his years in the Illinois State Legislature to the passage of the Thirteenth Amendment abolishing slavery. New York was the center for politics, media and economics in the 19th century. See how this center supported and tormented Mr. Lincoln both before and during his Presidency. Discover the people and events that worked with President Lincoln in Washington during the Civil War.